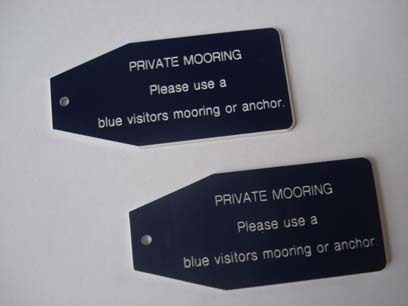 The blue visitor’s mooring buoys with mooring strops and yellow pick-up buoys are marked with Crown Estate’s tag numbers; the first mooring, A0181 (N 56 deg 06.690′ W 04 deg 54.39′), was originally laid on 28th April 2008 and is serviced annually in the spring of each year – last serviced on 21st May 2018 with the previous one on 22nd May 2017 (service, new riser, 20m grade 30 mooring chain replaced plus 1 tested bow shackle & 2 tested D shackles & new blue buoy, cost £663.60) and previously on 18th May 2016 – on 13th May 2015 (cost of service £110.00) – on 13th March 2014 (service cost £100.00) – on 9th May 2013 [20m grade 30 mooring chain replaced plus 1 tested bow shackle & 2 tested D shackles – replacement cost £250.00] – on 9th April 2012 with the strop changed, on 5th May 2011 and 10th May 2010). The second mooring, A3381 (N 56 deg 06.710′ W 04 54.40′), was laid on 28th June 2010 – last serviced on 21st May 2018 with the previous one on 22nd May 2017 (service & new blue buoy, cost £516.00) and previously serviced on 18th May 2016 – on 13th May 2015 – on 13th March 2014 (service cost £330.94 [20m grade 30 mooring chain replaced plus 4 tested bow shackles] – on 9th May 2013 – on 9th April 2012 and on 5th May 2011). The Carrick Castle Boat Club has raised thousands of pounds locally through its members and with the help of the Carrick Castle Amenities Association (a grant of £450.00) to lay our two visitors’ moorings without any financial support from the council or the Crown Estate (Note – a 15 tonne mooring costs about £1,500.00 and more to have laid). 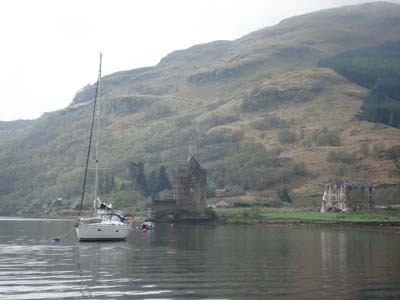 The two visitors’ moorings are one cable north of the castle – Visitor’s Mooring No 1 in approximate position N 56 deg 06.690′ W 4 deg 54.39′ and Visitor’s Mooring No 2 in approximate position N 56 deg 06.710′ W 004 deg 54.40′. The blue buoys with mooring strops and yellow pick up buoys will accommodate any private yacht or motor boat up to a maximum of 15 tonnes and are always serviced annually each spring. Those wishing to use the visitors’ moorings are asked to pay a £10.00 mooring fee per day/night (14.00 hrs to 14.00 hrs next day) that will go towards the annual servicing of the moorings and Crown Estate annual mooring fees. Lunchtime stopovers between 11.00 and 14.00 hrs are free… Outwith these times a short stay of 2-3 hours is chargeable at a rate of £5.00 – call the Moorings Officer on 01301 703709 to find out how to pay for a short stay please. 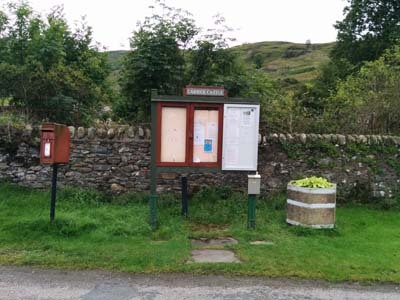 Instructions on how to pay are shown on the visitor’s moorings yellow pick up buoys, tags shown below and on the Village Notice Board by the Royal Mail Post Box behind the castle. Visitors to the club’s visitor’s moorings should note that all boats that use the moorings are photographed and if the user does not pay for the use of a mooring within 14 days, the boat’s photograph is put on the club’s ‘Name and Shame’ web page a week later and it will only be removed once the mooring has been paid for! Unfortunately there are some skippers around who don’t pay despite us offering safe moorings for their use? Honesty Pays! Two replacement blue visitors mooring buoys are now on after the annual servicing in 2017 of the moorings. Visitors can pay by using PayPal on the club’s web site using the quick and easy to remember URL http://www.pay-mooring.co.uk or on the club’s web site with links to pay for the moorings at the bottom of the Home or this page. Please ensure you use a valid e-mail address when using the WiFi service as invalid e-mail addresses are now rejected by our server. On 8th August 2018 the club’s WiFi service has been upgraded to receiving fibre Broadband beamed out to the two Visitors’ Moorings in Carrick Castle. The service should be a vast improvement over the past service provided as fibre Broadband has only just come to Carrick Castle. Please note that the Carrick Castle Boat Club complies with the General Data Protection Regulation (“GDPR”) that came into effect on 25th May 2018. Users of iPhones please note that there are Apple WiFi issues not connected with our WiFi system if you can’t use the Internet – please use an Android phone. The Committee hope that visitors will be honest and pay the fee as soon as they have Internet access. The club offers a WiFi Internet connection obtainable at the moorings for those who use computers on board their boats. The access is FREE. Registration is required to use the free service. Internet and e-mail services can be used once registered. Please note that with the change in the WiFi regulations, we have now installed a booster for the signal as from 24th August 2011. In heavy rain however the signal may become weaker. Our WiFi system complies with General Data Protection Regulation (“GDPR”) that came into effect on 25th May 2018. For those who do not have Internet access and wish to pay when in Carrick Castle, they can use the Letter Box marked ‘CCBC’ to the right of the Royal Mail post box alongside the Carrick Castle Notice Board opposite the castle. If using the box please include the name of vessel and date of mooring – there is a holder containing plastic bags where you can write the name of your boat and date of visit with a pencil provided. If you should have any difficulties in paying please telephone the Treasurer, Vonna Cowper-Smith on 01301 703646 or Secretary, Douglas Locke on 01301 703098 or 07748 130976. 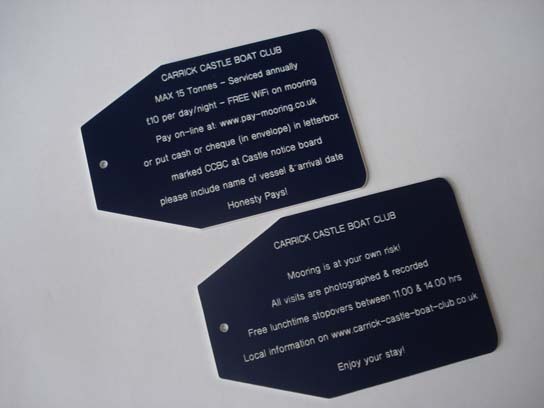 You can also pay by posting a cheque to the Carrick Castle Boat Club, c/o The Treasurer, Carrick Farm, Carrick Castle, Argyll, PA24 8AF or by visiting the farm behind the car park. 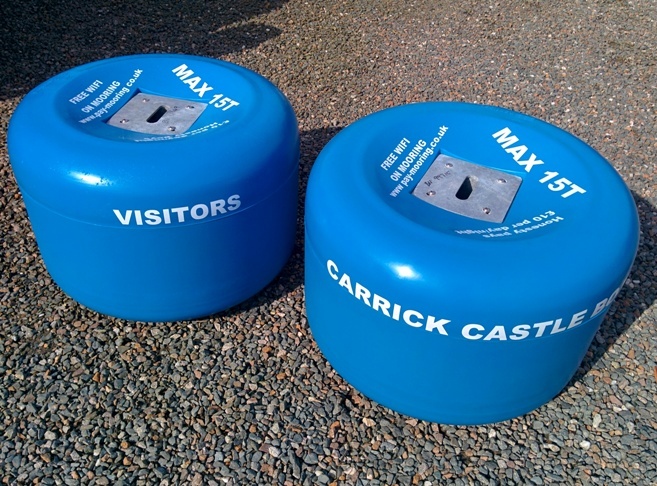 View the GENERAL CONDITIONS OF USE OF VISITORS’ MOORINGS IN CARRICK CASTLE. 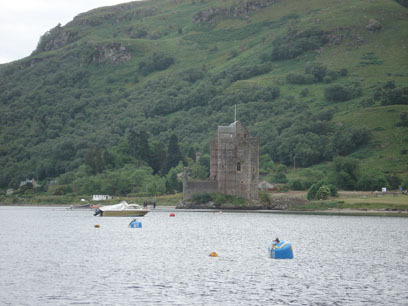 Download Carrick Castle Visitors Moorings Flyer for charterers, clubs and marinas. If you are interested in walking whilst in Carrick Castle see our Local Walks page. See the Local Information page for more local information.